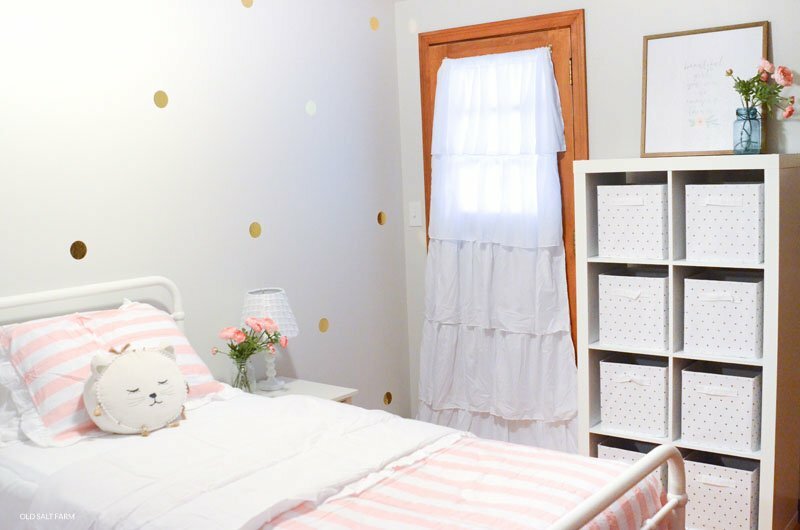 Girl’s bedroom makeover…from start to finish! 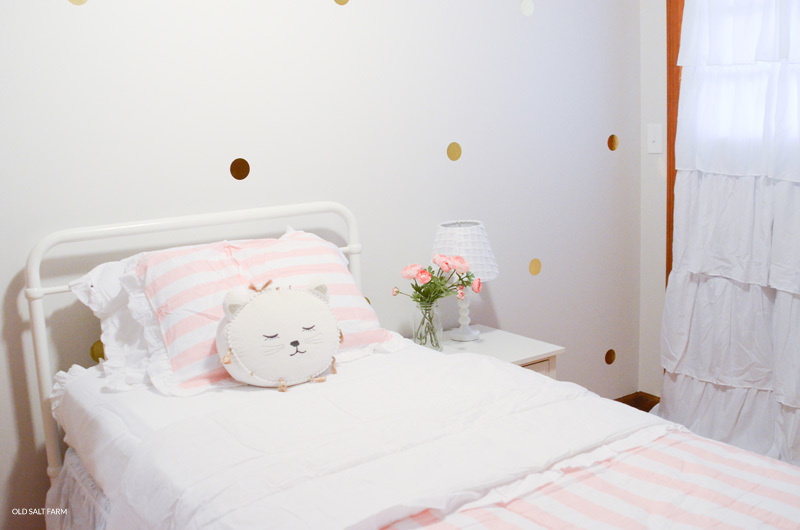 I am so excited to share this super cute little girls’ bedroom makeover! This room belongs to the cutest little 3 year old, and her mom is a dear friend of mine. They recently moved into a new (to them) home that they’ve been in the process of fixing up and making their own. 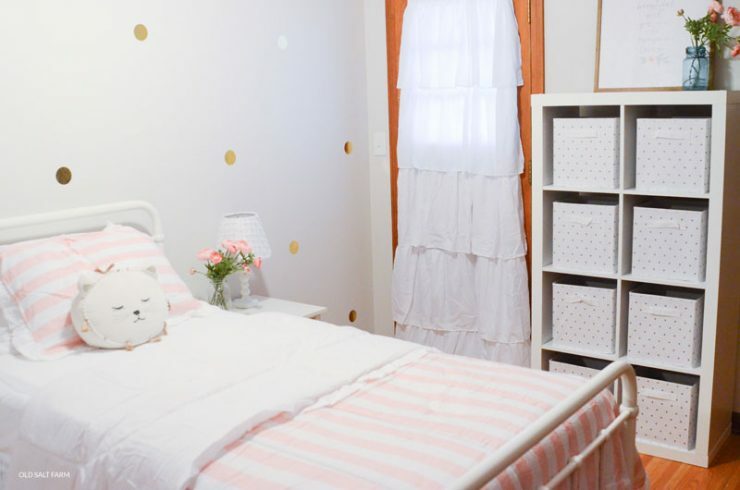 This cute bedroom just got a fresh coat of paint, and I thought it would be the perfect space for a head to toe makeover. A new bed & bedding, nightstand, and extra storage were all a part of the plan, and it turned out SO cute. 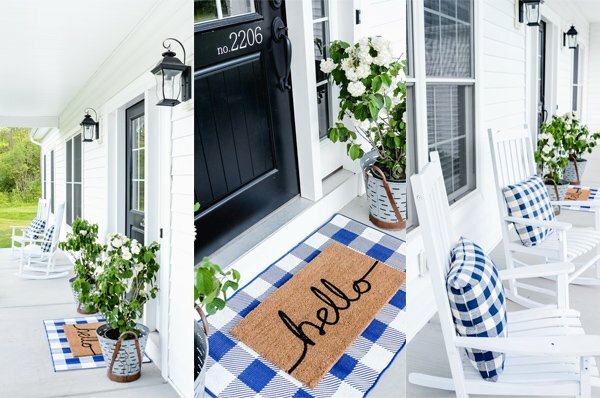 A huge thanks to Better Homes & Gardens at Walmart for sponsoring this post. As always, all opinions are 100% mine. Affiliate links are also included below for your convenience. If you click on a link and make a purchase, I receive a small commission at no extra cost to you. 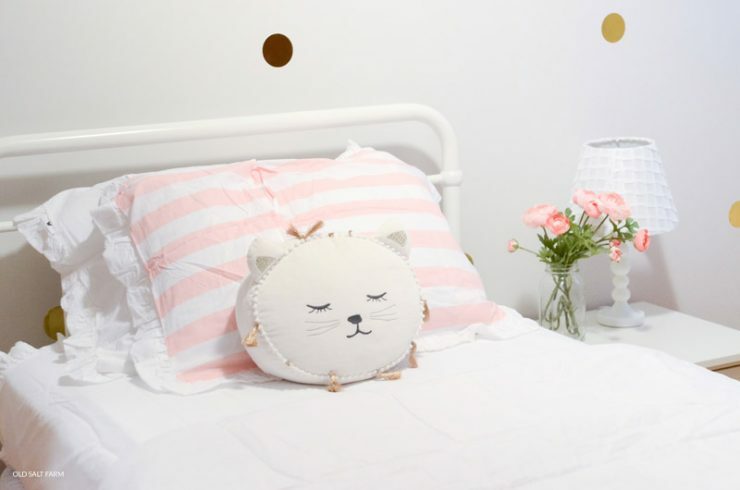 This little girl’s favorite color is pink, so I knew I needed to incorporate it into the room. There’s also no window in the room. Instead there’s a door with a small window that leads to a balcony area. To bring more light to the space, I decided to go with a lot of white, with pink and gold accents. 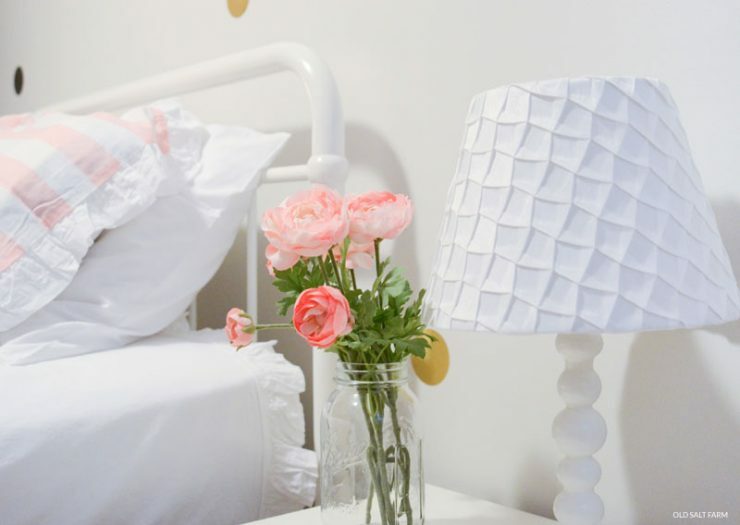 The white metal bed by Better Homes & Gardens is an absolute favorite of mine. All of my kids have one too! My boys have it in black, my twin girls have the same bed as this one, and my youngest has it in the full size. 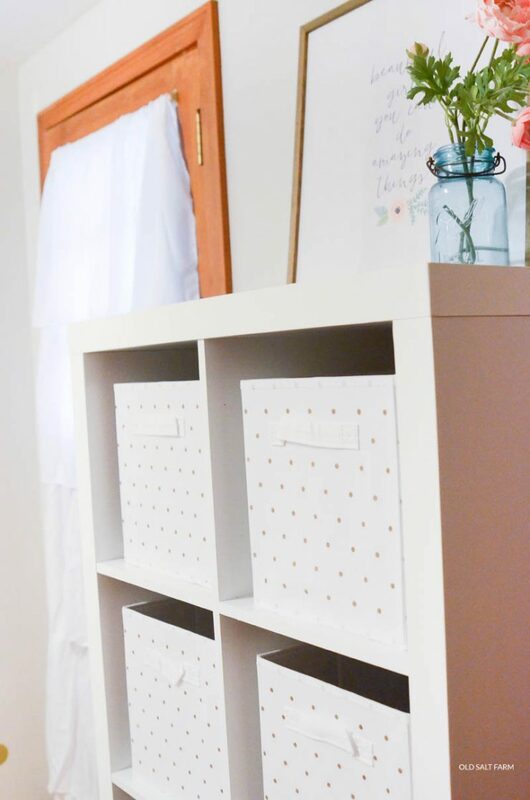 It’s both sturdy and adorable, and I just love clean lines. I also found the CUTEST comforter set. It’s actually reversible…white on one side, with pink and white stripes on the other side. 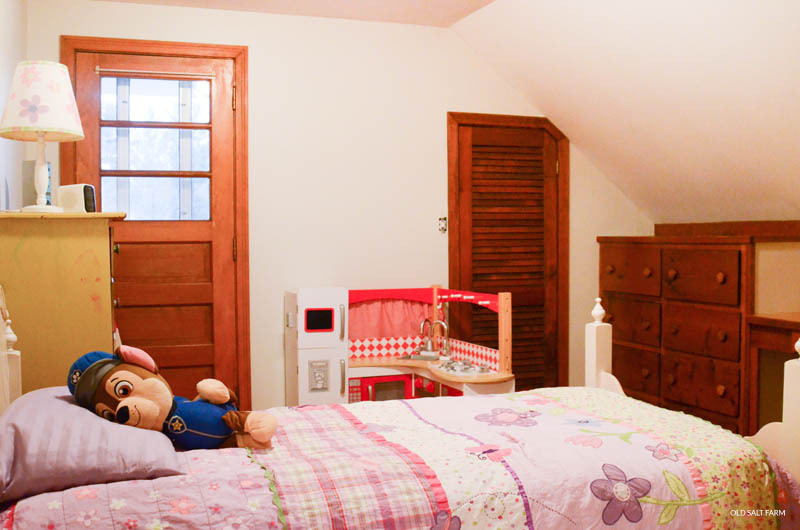 There are ruffles around the edges, making it the perfect choice for this little girl’s room. 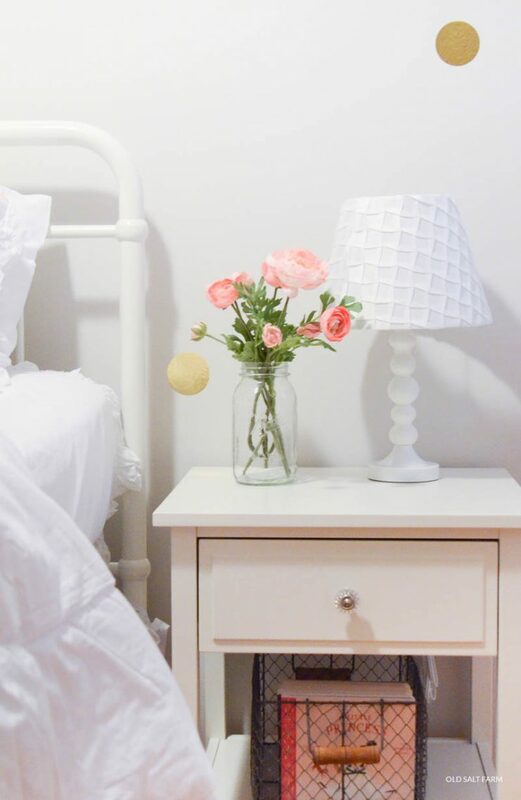 I adore this white nightstand. 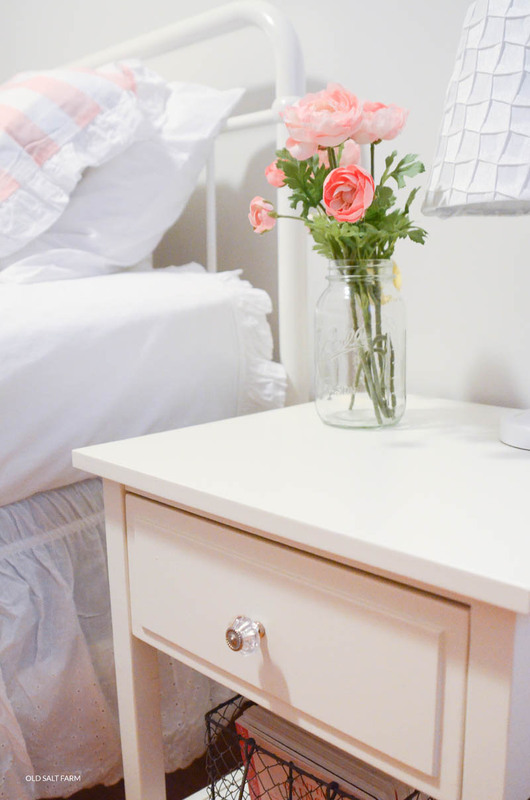 It has the cutest crystal knob on the drawer, and it goes perfectly with the bed! I’m seriously in love with the pleated lamp shade…it adds the perfect amount of detail! Almost every room could use a little extra storage space, and this one was no different. This cute little girl has a bunch of toys and stuffies that she loves, and so I added an 8 cube organizer that will do just the job! After we finished the room, my friend told me that these curtains were her favorite part! 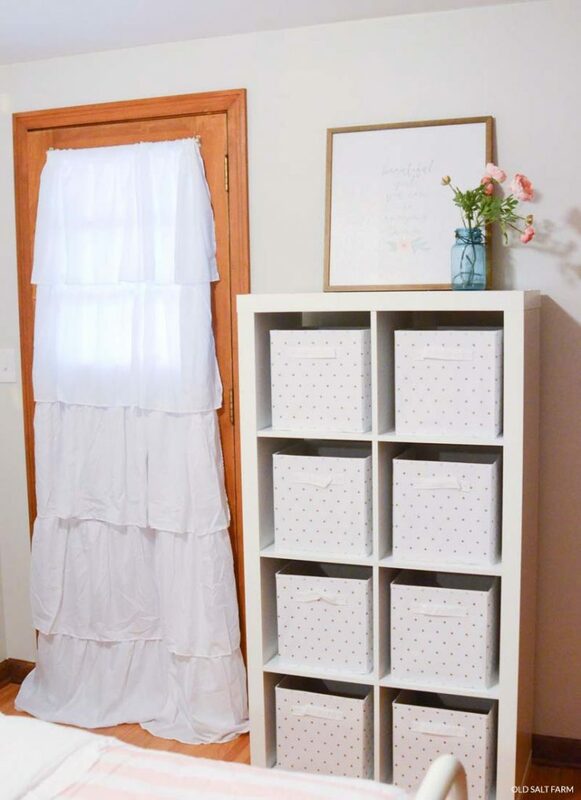 She loves that they add privacy, but at the same time keep the room light and bright and airy. The ruffles are the perfect touch, and so charming. 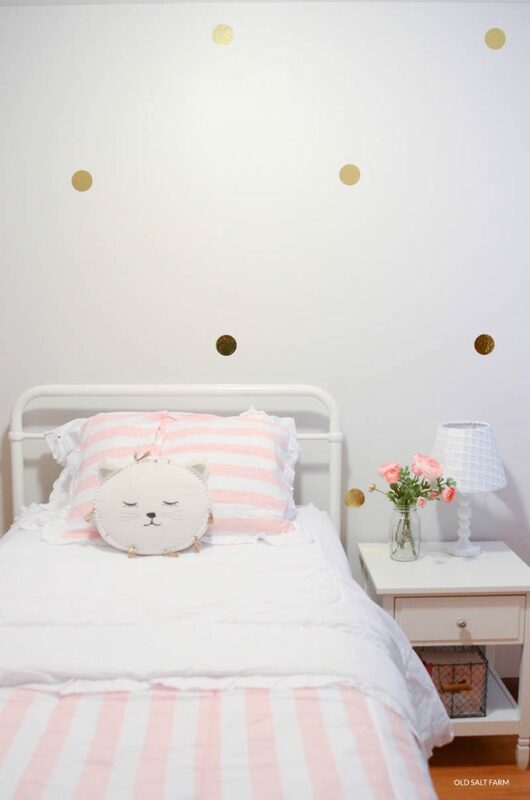 On the wall behind the bed, I added gold polka dots from floor ceiling, which is a great way to decorate a wall without spending a lot of money. 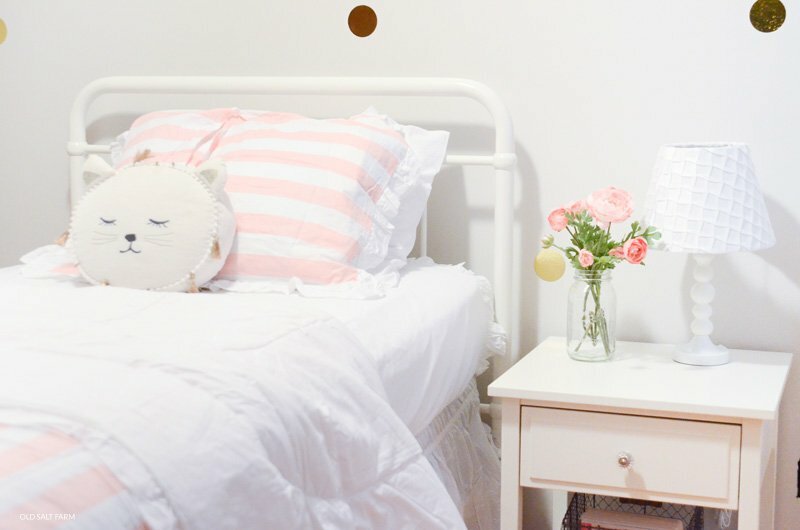 They also help tie the whole room together, and add contrast with the pink and white. 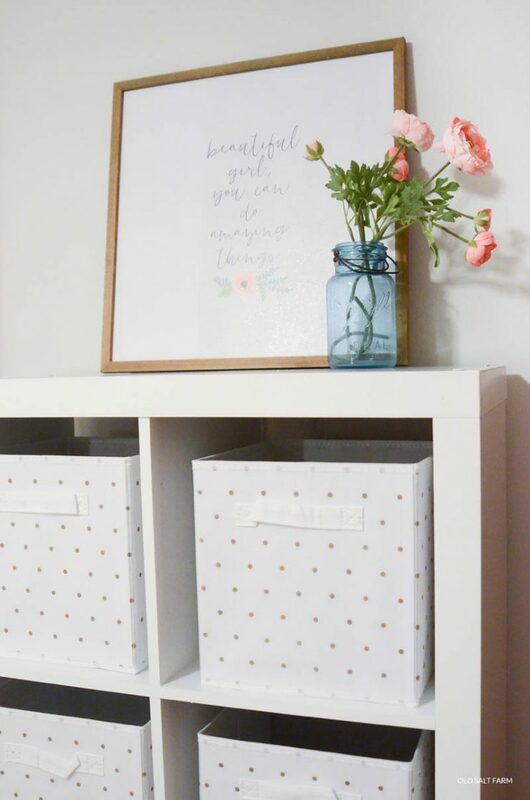 I also added mason jars of pink flowers to the nightstand and organizer, along with a framed quote. Simple touches, but they bring the room together and make such a difference. This was such a fun project for me, and I loved seeing it all come together. 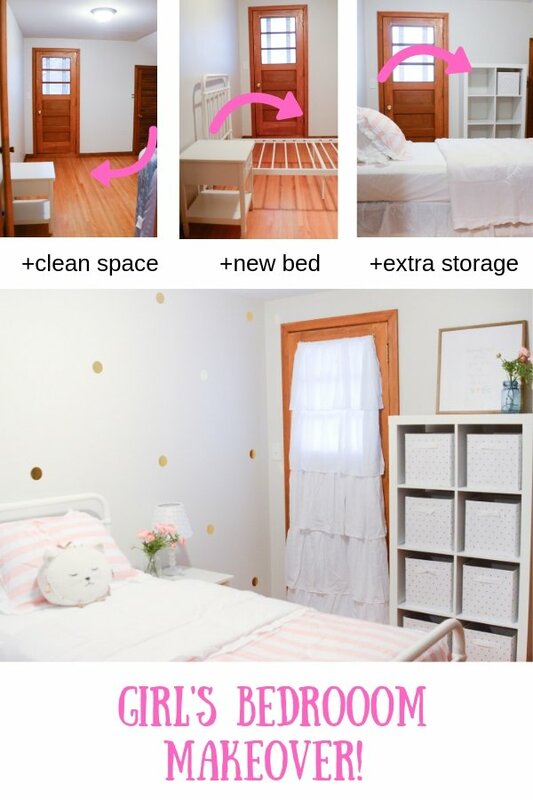 My friend’s little girl loves her room, and that’s the most important part! Beautiful bedroom. Any girl would be happy to have it. Where did you locate the framed quote? All so cute! Unless I missed it, how about the curtains on the door? So cute! Did you make those?